Loerie Lodge is a beautiful 3 story, Bali-style, 4 bedroom house, which boasts the most magnificent views of lush indigenous vegetation of Eden Rock Forest Estate and the warm Indian Ocean across the horizon. A large semi-covered front terrace, situated above a secure double garage, offers particularly spectacular views and is a wonderful setting for enjoying sundowners to the backdrop of twittering birdlife. The back of the house has an additional terrace which overlooks the garden & swimming pool. The back of the house also has a convenient outdoor shower which is fantastic for a quick rinse-off after a long walk on the nearby Pennington beach. The spacious lounge has a padded lounge suite facing a flat screen TV with full DSTV bouquet so guests won’t miss out on those important sporting events or favourite shows. The dining room with eight seater table leads out to the terrace and onto a fully equipped kitchen. Kitchen facilities include: cutlery, crockery, microwave, kettle, toaster, a hob stove, fridge, dishwasher and washing machine. 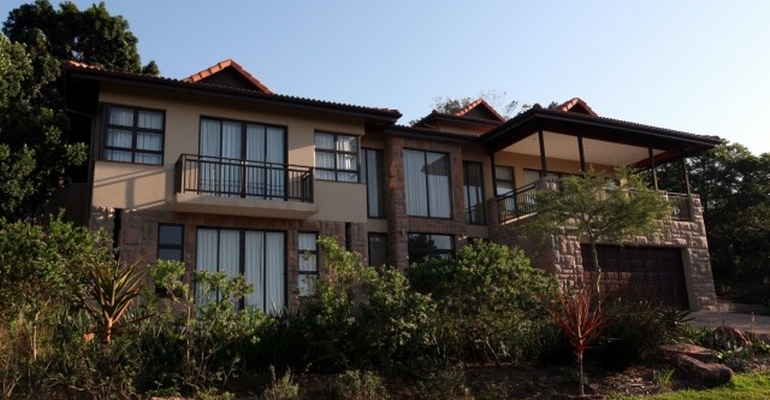 Each of the 4 bedrooms in Loerie Lodge is airconditioned and enjoys sea views. The main bedroom has a King sized bed and en-suite bathroom with large corner bath, seperate shower & double basins. This room leads directly out to the pool area. The additional 3 bedrooms have twin single beds, one of which is an en-suite with bath & shower.